Since we do a lot of applications for Outlook, we also use them in our everyday work. We use CodeTwo Public Folders and CodeTwo Exchange Rules. Some time ago we created a program for ultra-fast and automatic email account configuration. We love this app so much that we decided to share it with you! We have just released a free tool called CodeTwo Outlook AutoConfig. It’s an amazingly easy application that automatically configures an email account in Microsoft Outlook, Outlook Express, Windows Mail or Windows Live Mail. If you want to use any of the above-mentioned email clients, you no longer need to know any technical details like SMTP and POP3 addresses, mail server port numbers, encryption methods, etc. Using CodeTwo Outlook AutoConfig, you can create your email account in split second only by providing your email address. Download CodeTwo Outlook AutoConfig and launch it. Enter your email address – a suggested Display name will appear beneath. Display name is what is shown to recipients instead of your full email address. Naturally, you can change the display name to anything you want, e.g. your name and surname. Select your email client and click Create account. Note! If your mail client is currently opened, you will need to restart it for the changes to take effect. 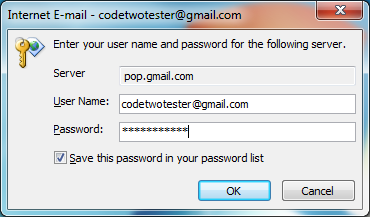 Your email program will ask for your password (the one you always use for this particular email address). Enter your password (make sure it is correct), check if Save this password in your password list is selected and click OK. This is all you need to do to create your email account in Outlook, Outlook Express, Windows Mail and Windows Live Mail. Don’t wait and download CodeTwo Outlook AutoConfig – it’s easy-to-use, it’s quick, it’s free! You might ask, why did we create such a program if there is a similar functionality built into Microsoft Outlook already? The e-mail account auto-configuration functionality in Outlook is primarily designed to work with Exchange Server accounts and it doesn’t work as expected with POP3/SMTP service providers. For example try to auto-configure your @gmail account in Outlook. First of all, you will wait for about 2-3 minutes before Outlook finishes its job, and after that you’ll see that in result you receive an IMAP account configured! I didn’t find a way to force Outlook to create a POP3/SMTP account. Outlook AutoConfig properly configures my e-mail accounts in split second, so I’ve got no time to dig in what’s wrong with Outlook built-in function. 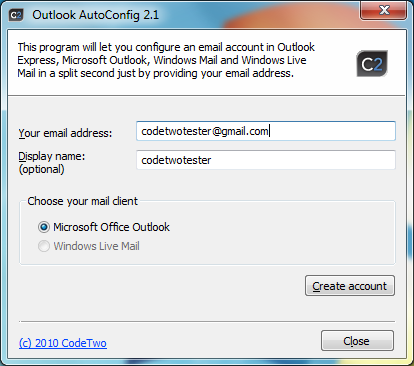 CodeTwo Outlook AutoConfig will automatically configure your email account in Outlook, Outlook Express, Windows Mail and Windows Live Mail. Normally you have to know pop3 and smtp addresses and port numbers of your email account and have to add it manually. With this program, you only need to provide your email address and the remaining part is filled in automatically – so you don’t need to know any technical details concerning your email account. It is perfect for NON-IT-GEEKS and for Geeks who have multiple email accounts and have just moved to a new system. Hi Simon and all – What problem does it solve? Not trying to be negative – just trying to understand why you wrote it. Thanks! Thanks guys. Glad you like it! It really safes time. Especially useful when you move to a new system and have a few email accounts. Thanks Code Two! Awesome app! Finally! It is so sleek with gmail. can’t believe what I am seeing. great tool. it’s a savior for millions outlook and windows mail users. thank you! Thanks for this tip! I created my account in Outlook Express!